Co. Kilkenny: Abbeyville, Adare North, Adare South, Ballingarry, Ballyagran, Ballygrennan, Ballynabanoge, Ballynoe, Castletown, Coolrus, Crean, Crecora, Croom, Dunnaman, Fedamore, Garrane, Grange, Kilfinny, Kilpeacon and Rathmore. The Guardians met each week at noon on Thursday. The new Croom Union workhouse was erected on a three-acre site half a mile to the north-east of Croom. Designed by the Poor Law Commissioners' architect George Wilkinson, the building was based on one of his standard plans to accommodate 600 inmates. Its construction cost £6,200 plus £1,150 for fittings etc. The workhouse location and layout are shown on the 1899 map below. 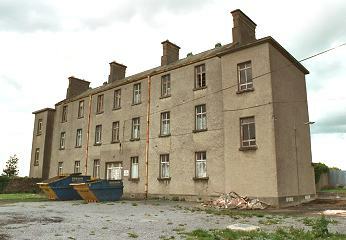 The buildings followed the design used for most of the new union workhouses of this period with a long two-storey children's block at the front, with the workhouse entrance at its centre. To the rear was a T-shaped main building, with its single-storey central spine rising to three storeys in the main range. Further small blocks, perhaps including an infirmary and idiot wards, were located at the rear of the site to the east. A separate fever hospital was erected at the north of the workhouse. The first Master of the workhouse was a Mr Carroll who had three sons who became priests, and whose wife taught the workhouse children. A further son, Owen, later succeeded his father as Master of the workhouse. After Mrs Carroll's death, the workhouse children walked to Croom school. In 1895, Croom was visited by a "commission" from the British Medical Journal investigating conditions in Irish workhouse infirmaries. Their report found much to criticise, most notably the "scandal" of an unscreened corpse being left in the sick wards overnight. Suggested improvements included the provision of dayrooms and smoking rooms, improved sanitation, and an end to the use of pauper nurses. Further details are available in the full report. 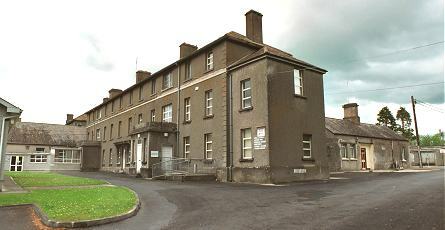 In 1924, following the formation of the Irish Free State, the workhouse became a County Hospital, with around £25,000 being spent on improvements to provide a total of 150 beds. The fever hospital was also upgraded at a cost of £10,000 to become a County Fever Hospital. In 1956, following the opening of a new regional hospital, the site became the home of St Nessan's orthopaedic hospital, now known as the Mid-Western General Orthopaedic Hospital.